Luckily they not only provide a way to remove the search box from the taskbar, but you can change it into an icon, or you can remove it entirely and then it’ll show up on the taskbar only when you open the Start Menu (so you can still search for your apps). We’re not entirely sure if we like the idea of a digital assistant as part of Windows, but if you’re using the preview, we recommend that you test it out at least to give it a chance. If you don’t like it, then you can disable it and make the search box revert back to the Windows 8.x behavior where it searches your apps as well as the web. If you change it to an icon, it’ll show a circle like you can see below. And if you disable it entirely, it’ll be removed from the taskbar. You can also hide that Task View button while you are at it. 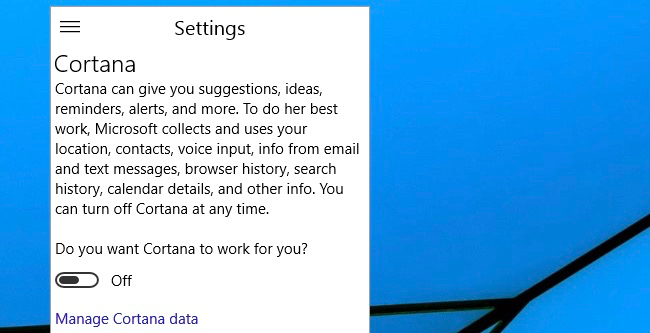 If you don’t want Cortana to show up in your search box, you can click on the little hamburger icon on the top left and then choose Settings. And then simply click the toggle to disable it. Again, this is a new technology and if you’re using the Preview of Windows 10 you should probably leave it enabled and give Microsoft some feedback on what you think. But since it takes up way too much space on the taskbar, it’s nice that you can customize that. Wonderful post. Will check this out soon. This is really a fascinating post and quite useful for everyone. Keep posting!! Wonderful tutorial to hide search box. Well I think I used windows 10 only for a while since a stable version is not released yet. Nice tutorial to hide and unhide the search bar, I really love this feature. If you don’t like it, then you can disable it and make the search box revert back to the Windows 8.x behavior where it searches your apps as well as the web.